The high calorie content in banana makes many of you wonder why Banana is being added to the weight maintenance or a weight loss diet. 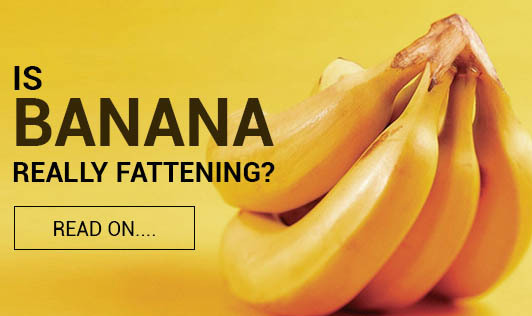 The myth is debunked that banana leads to weight gain. Bananas are quick and easy to grab snack when you are at work, play or on the road. Evidently, Banana is one amongst various fruits that provide close to 100kcal like 1 large apple, mango etc. It provides many nutrients like carbohydrates, fiber and other essential vitamins and minerals. Additionally, bananas contain a resistant starch, which is more like a fiber that takes longer time to digest and thereby it helps keep you full. This is the only fruit that can satiate the hunger instantly and is suitable food for children as well. It falls into the category of low GI (Glycemic Index) foods that help to release the blood sugar gradually into the blood stream. However, there is no single food or fruit that lead to weight gain. Portion control is the key component that one should consider to consume bananas. As you all know, lifestyle factors like lack of exercise, poor food habits, stress etc plays a role in the weight gain. So, I think Indians can definitely accept banana as part of their daily diet. If you are overweight, stick to one banana a day than having two!